Do you believe fantasy does not infringe on your reality? Do you believe in the need for humanity as you know it from fiction? For you, who may believe such things, how do you react when a work lacks the intention of appealing to you in this way? Would it be in outrage, in disgust, in resentment, scorn and derogation for failing to be well-written? If you were, what would you think if those very characters who face turmoil so that they may cater to what you need out of them, appeared before you with defiance and indignation? Do you believe you would reflect on your own perceptions and hold remorse for your demands of them? Or would you think that it is their wrongdoing to hold you accountable for how you judged people who you would have never expected to be real? 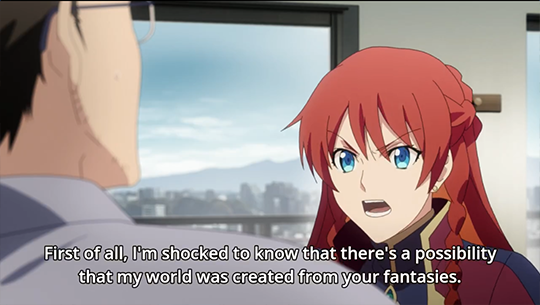 I consider this to be a very important factor to consider if you will be watching Re:Creators, where fictional characters do in fact manifest in reality. If you will not even be willing to ask yourself about how a show which offers a situation where reality and fiction intertwine becomes relevant to your perception of stories and their characters, then there is nothing of meaningful value for you to find here. However for me, who wishes from fictional characters the same I would of real individuals, and desires for the same on real individuals as I would for fictional characters, there was no setting more fitting for me to witness in action, no scenario with more potential for a compelling portrayal to witness. That is because I knew all too well of what the popular understanding of what it meant to be written properly was. I knew that stories are supposed to be made in accordance to criteria decided upon by humans as being objective quality. I knew all the hatred in justice human beings could have for others once they had an excuse to license themselves to all manner of vilification and all manner of arrogation with no risk of disgrace they could consider valid of their own character for their scorn to all works which were not consistent to what fiction should be in their minds, how valid they thought that to be for how consistent it was with what others had to say of fiction as well. The very same kinds of people who would serve the people that qualify for that were now depicted alongside the very fictional characters they would be so likely to undermine from their hearts for not belonging to the reality they did. 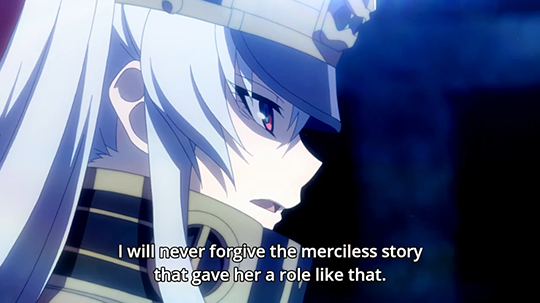 I wanted to see what Re:Creators could have to tell me once this was established. However, I was also very alert throughout nearly the entire run, anticipating something that may have crushed my hopes for what there was to see. As a show with a premise of fictional characters becoming real, the outcome of it to turn into yet another formulaic construction made to appeal to criteria had me fraught with fear. Even if it is fiction about fiction, it was still fiction itself and thus vulnerable to coming back around to appealing to the demands of the systematic thinkers. No matter how many times it seemed contrary to following such conventional matters, I remained afraid until the very end. I am writing this now of course because it did not turn out to disappoint and followed through. Everything felt so much more authentic, free of considering what it should be doing as a story. The creations, naturally as a result of being from varied creators, all thought differently and also lived life outside of the plot, even making a point of how true this was with what they were indulging in that was present in reality which wasn't in their fictional worlds. They weren't made to come to a conclusion with a unified message or a moral to the story, they were just people that learned new things and thought with their hearts according to what they ended up in. Characters only changed their beliefs for circumstances they recognized as warranting a different outlook from their personal observations rather than through their victimization or a calling out of how they weren't in the right. Where there was conflict I had seen it to be opportunities to further express an individual rather than a mere means for suspense. This was not a story made for you to exercise your appreciation for humanity's weaknesses or their complexities. Every last one of the characters are rather simple and fairly straightforward. The plot was written organically without much thought for twists, branching, or even having to make sense, and it sets landfills of exposition your way. There is barely any sense of power balance. For some, that would bring into question how it could be interesting at all. However no matter how mediocre it could be considered on such values there is no doubt that it provoked me into reflecting on the world with a new perspective. Why could it do this? 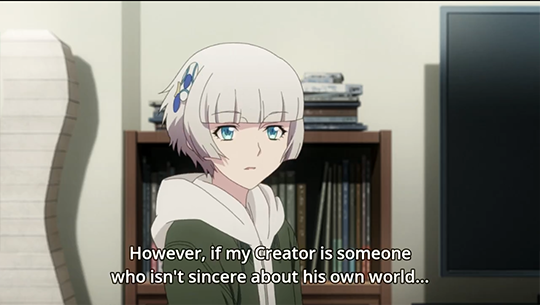 Because Re:Creators set a precedence for trust. From the very first episode, with no character background even provided, I saw a vindictive girl dressed in exaggerated military-inspired vesture, sporting giant anime hair with locks snow white and a gaze of piercing red with a dozen swords flying and spinning to her will. She did not appear in a high school uniform, a commoner's dress, an armor of humble design, she wasn't someone made to be a character that the viewers would believe to not be beyond themselves. From her exterior features alone I recognized her as the enemy of the system that decided the purpose and procedure of how people like her should exist. Consequently, because of the very nature of this show involving both creators and creations, her very first appearance was also recognized by me as someone who was born from a sincere heart. She wasn't designed to be marketed, she was designed from the soul of the artist. This meant that the one who designed her actually, really cared about her. She was more promising than any other creation in the show as someone worth trusting in because of how clearly genuine she was made to seem, a true expression untainted with the chains of so-called good sense. The question my mind constantly had to ask the show for answers was, what did it intend to show me by including this kind of character, who was practically a magnet for the hatred of the literary? What was her fate to be and why? What does she represent and how will they incorporate that into the story? What even led them to take such a risk as to include her at all? The answer to that was that her existence provided the foundation for connecting the story to the world. Of any character that could have been used instead, that she was chosen gave the show the freedom to go beyond the system by design. 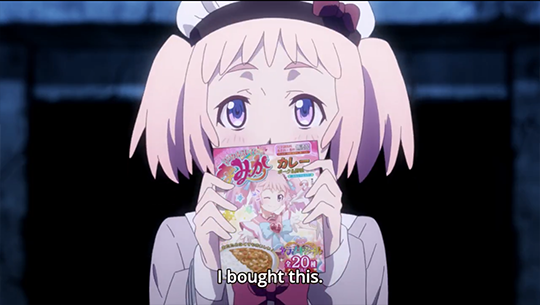 Even fanart of her made by amateur artists on our side of the world was featured in the actual anime. This all came down to who Re:Creators was for, and the answer was right there in the title. If you are an artist or an author or perhaps even a musician or even if you ever sincerely wanted to be one, then this anime could either be your sanctuary for peace of mind, or it could do nothing for you at all other than send you into a furious rejection of everything that it stands for.